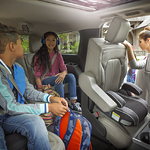 An SUV can accommodate large families. They come with plenty of passenger volume, and some full-size SUVs offer third-row seats. SUVs can also be beneficial for pet owners. It isn't safe to let pets roam freely in the cabin, but SUVs provide you with enough space for a pet carrier. SUVs also offer plenty of cargo space and seating configurations. Another advantage of owning as SUV is that you get enhanced off-road capability. SUVs have a higher ground clearance than smaller vehicles, and they are usually equipped with heavy-duty suspension systems. SUVs also offer impressive towing capability so that you can easily transport boats, motorcycles, and campers.